Good oral health habits are important for everyone, but seniors especially need to pay attention to dental concerns that develop with age. We talked to Toby de Boer, a registered dental hygienist in Whitby, Ontario, to find out important tips on maintaining good oral health. 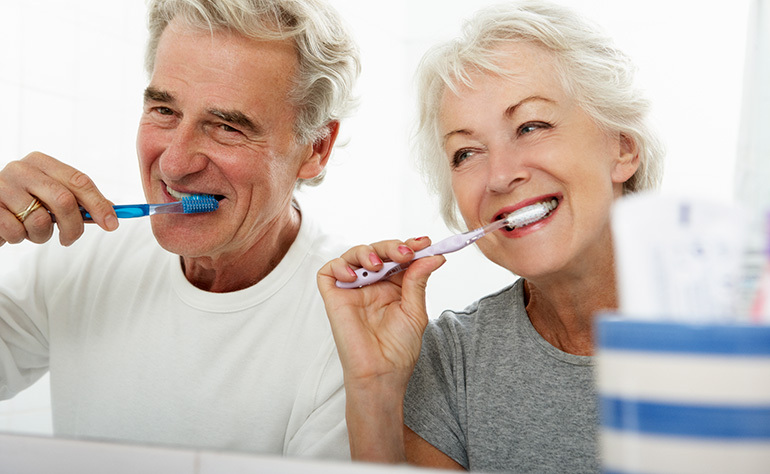 Q: What are some good habits that seniors should follow to maintain their oral health? A: Unlike previous generations, seniors today are keeping some or all of their teeth for life. Brushing twice a day, flossing once a day and having regular dental checkups and cleanings are very important practices to follow to maintain their teeth. Q: How often should seniors see their dentist? A: Just as at any age, frequency of dental checkups for seniors is largely based on their individual oral health. The general guidelines are three-, four-, six- and nine-month intervals. The more severe the gum disease, the more often a person should be seen. That said, seniors often have more advanced cases of gum disease and should be having more frequent dental cleanings. Q: What oral health concerns are common among seniors? Q: What medical conditions might affect seniors’ oral health? A: Medical conditions such as arthritis, diabetes, heart disease, cancer, respiratory illnesses and Alzheimer’s can certainly affect seniors’ oral health, the same way oral health can affect their overall health. Q: If seniors’ oral health problems aren’t treated, what might the consequences be? A: They could experience tooth pain, therefore making it more difficult to chew their food. This could lead to lower quality of life as they cannot enjoy their favourite foods, or they stop going out to restaurants with their friends and family. It could also lead to malnutrition and weight loss. Q: What other challenges might seniors experience while trying to take care of their teeth? A: Body pain from illnesses such as arthritis can make it difficult to brush and floss. Suggestions for handling this problem include fitting a tennis ball over the handle of a regular toothbrush for a wider grip, making it easier to hold with sore hands; using a power brush, which does all the work and times the brushing as well; floss on a wand or floss holder; using a water flosser; using a rubber tip or an interdental brush, such as Sulcabrush®, to supplement brushing; or using hard or soft toothpicks. Q: What are some challenges associated with dentures? A: There are a number of challenges. Dry mouth makes it difficult to keep dentures in place. As a person ages without teeth, their bony ridge flattens, so the denture has less to grip on and can be loose or fall out. Seniors with dementia may take out and accidentally lose their dentures. Seniors also need to soak dentures overnight with denture tablets and water while letting the gums recover—this is as important as brushing the dentures. It is recommended for people with full dentures to have a dental checkup once a year. Q: How do smoking and drinking alcohol affect oral health? A: The negative effects of smoking increase over time, so seniors who have been smoking a long time have a much increased risk of tooth loss and oral cancer. Alcohol consumption over time is also a big contributor to tooth loss and oral cancer. Q: What other tips can you share for seniors’ oral health? A: If dry mouth is making it difficult to swallow dry foods such as crackers, some seniors compensate by using sugary drinks and candies to wet the mouth, which may lead to cavities. A better option would be to use products from the Biotène® line, such as moisturizing mouthwash, spray or gel, to moisten the oral cavity. Sticking with plain water as a lubricant is also a wise choice for the mouth and overall health. An increasing number of seniors are getting hip and knee replacements, so if they are bed-bound temporarily, they can brush in bed by being given two cups, one with water for rinsing and an empty one for spitting. Seniors who are house-bound, staying in a nursing home and/or can no longer get out of bed may be able to use the services of a travelling Registered Dental Hygienist who does house calls.